To many people, Richard Smalley was the foremost leader in nanotechnol-ogy. He has often been noted as the "Father of Nanotechnology." Richard Smalley was a Rice University professor who won the Nobel Prize in chemistry in 1996. 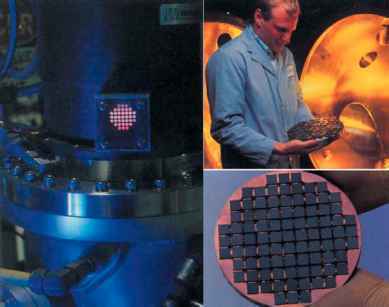 Richard Smalley is mostly known for his work with carbon nanotubes, (known as the "Buckyballs"). Smalley was hopeful that nanotechnology could solve the global energy problem, which would ultimately solve other worldwide problems such as hunger and water shortages. He believed the potential for nanotechnology to benefit humanity was virtually limitless, and he abided by the mantra: "Be a scientist; save the world." The long-term benefits of nanotechnology will lead to new means of reducing the production of wastes, cycling industrial contamination, providing potable water, and improving the efficiency of energy production and use. Good news for all. However, there are concerns that the introduction of large quantities of nanostructured materials, such as nanoparticles, into our everyday life may have ethical, legal, and societal consequences. Two independent studies released in 2003 included the risks of using carbon nanotubes. Chiu-Wing Lam of NASA's Johnson Space Center led one of these studies and the other was led by David Warheit of Dupont. Each study found that carbon nanotubes, when directly injected into the lungs of mice, could damage lung tissue. One overseas company that makes cleaning products using nanometer-scaled materials had to remove these products from stores because several consumers were getting respiratory problems from using the product. Nanoengineered carbon is the most common material used in the nano products followed by silver, a metal, and silica, a compound composed of silicon and oxygen.